It’s fairly simple: Peer-to-peer fundraising is when you get your supporters to fundraise on behalf of your nonprofit. This type of fundraising has a handful of benefits for the nonprofit, but the best one (I think) is the relationships that are formed between the nonprofit and the volunteer fundraiser in the process. Peer-to-peer fundraising can be as successful as the effort that you put forth in your relationship with your volunteers. 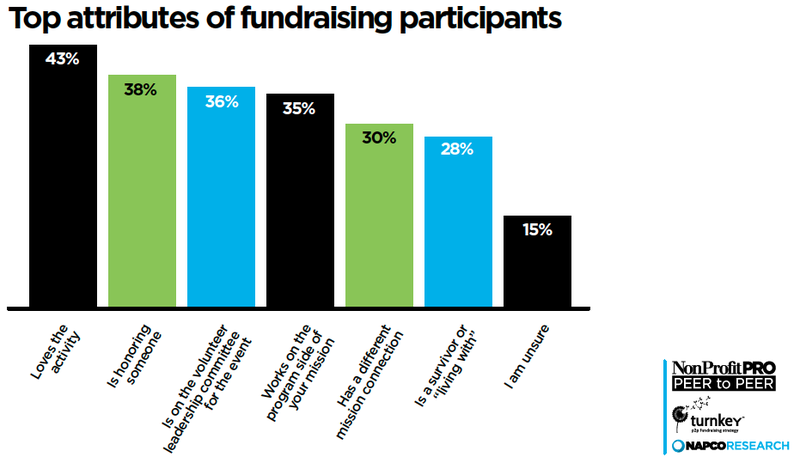 What Characteristics Make Up the Best Fundraiser? In fact, the most engaged and successful volunteers are passionate about the nonprofit and/or the nonprofit's mission. In our study, we asked respondents to check off the top attributes of volunteers in their highest revenue-producing peer-to-peer events. And while “loves the activity” (43 percent) scored the highest percentage, it’s important to note that the other top ranking attributes were related to some kind of emotional connection to the mission/cause or nonprofit: “is honoring someone” (38 percent), “is on the volunteer leadership committee for the event” (36 percent) and “works on the program side of the mission” (35 percent). To completely understand why a volunteer supports the nonprofit and is participating in the peer-to-peer event, it’s important for nonprofits to take that extra step to find out what is driving that volunteer’s passion. This not only creates a better, stronger, more authentic relationship with the volunteer, but it also has the potential to improve the event’s year-after-year retention rate. If a volunteer feels appreciated for their efforts by the nonprofit, they will want to continue to do “good” and volunteer again next year. 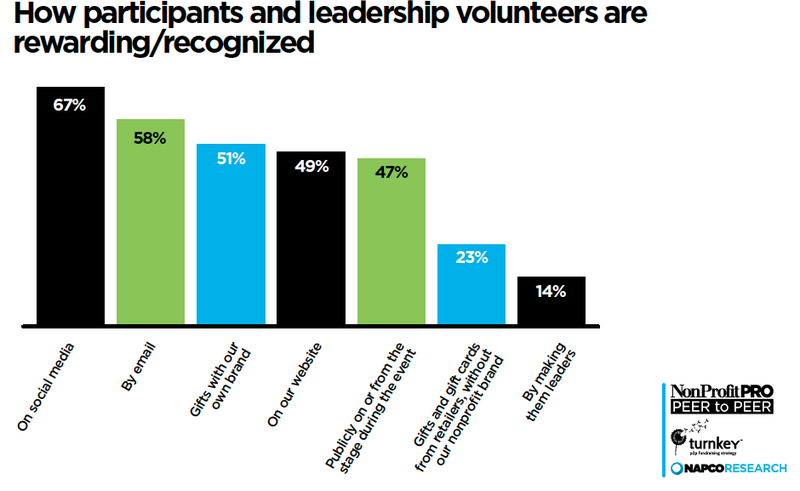 How Are Volunteers Being Recognized? It’s crucial for volunteers to be recognized and rewarded for their efforts. After all, they are fundraising for your nonprofit by their own free will. While the feeling of raising money for a good cause is a great benefit on its own, that feeling can be increased by tenfold if you are recognized and rewarded for your efforts. Before we get into how nonprofits should be recognizing and rewarding their volunteers, let’s take a look at how they are doing it right now. The study found that the majority of volunteers are being recognized digitally—on social media, by email and on the nonprofit’s website. It’s also significant to note that 51 percent of respondents said that they reward volunteers with gifts from their own brand (e.g. t-shirt, hat, mug). While this is great, we couldn’t help but consider whether or not nonprofits are recognizing their volunteers on a digital platform because it’s the most convenient and can be done quickly and easily. By recognizing them on social media, by email and on their website, along with giving them a small, inexpensive gift, it would positively reinforce that relationship with the volunteer. To read the entire study and to learn more about volunteers in peer-to-peer fundraising, click here. Be sure to register for this year’s NonProfit PRO Peer-to-Peer Conference. This one-of-a-kind event is happening on Nov. 9 in the historic city of Washington, D.C. In addition to learning about the key findings from the “2017 Peer-to-Peer Fundraising Study,” you’ll hear from some of the most inspiring thought leaders in the nonprofit sector, as they discuss the challenges facing the peer-to-peer realm today.